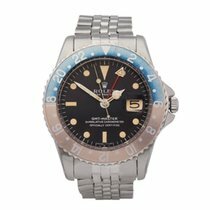 This is a pre-owned Rolex GMT-Master pepsi gilt dial gents 1675 watch. 40mm case size in stainless steel, black dial on a brown leather bracelet, powered by an automatic movement. This Rolex is in good condition complete with xupes presentation pouch. Circa 1965. Our Xupes reference is COM1640 should you need to quote this. "Here is an example of a crisp gilt gloss dial in almost immaculate condition, other than some residual moisture marks at 12 and 2 o’clock. This 1965 type of gilt gloss dial was discontinued the same year to make way for white printed dials on black matte finish, making this one of the last survivors in its class. This gilt gloss dial, with five minute marker ticks underneath the “Swiss – t < 25”, is known as a Non-Chapter Ring Type C. This would have been one of the last gilt gloss dials made for this model reference, and followed in sequence the last Swiss Only Non-Chapter Ring dials. The watch has had a small GMT hand replaced by a GMT hand with a larger arrow in the late 1960s. This dial shows original hands and lume spots, and the slightly larger-than-normal hour markers. The case is in fine condition overall with some marks to the back of the case lugs and two small nicks to the right front lug. The bezel is showing signs of ageing and discolouration giving it an attractive patina. The case back reads “IV 65” stating it’s production as the fourth quarter of 1965, with a witness signature from a watchmaker in 1987. The movement is stamped 1570, which was the latest GMT calibre from Rolex, with a “hacking” feature. This calibre was introduced in 1964, and the so-called hacking feature allowed the second hand to stop running when the crown was pulled out for more accurate time setting. The second hand continued to run in previous calibres even when the crown was pulled out. The watch is fitted with a brown leather strap with a steel Rolex pin buckle."